As the leader in the Compressed Gas Cylinder industry, Label Solutions leverages our material/surface testing expertise and volume buying power to ensure your label project is effective and affordable. Our technology ensures your brand and instructions remain clearly legible on your products for the full duration of the products' warranty period. Most importantly, we work with your team to deliver fully compliant fire extinguisher labels. Label Solutions is your One-Stop destination for tag & label needs! NEW! This product is designed specifically for distributors seeking to minimize label handling during extinguisher inspection and refill. 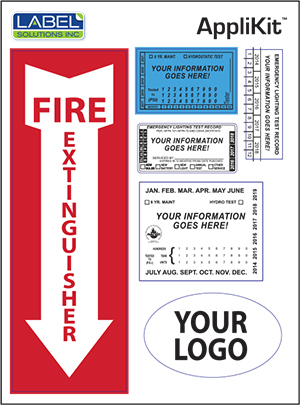 Tell us what labels you need per extinguisher area, and we'll create your own branded Applikit with your logo. You can either attach the labels at your facility, or apply on-premise at your customer's site. Design your Applikit™ labels for hole-punch or for marking with a pen. AppliKit™ improves handling efficiencies in the field, and delivers labels that are fast, simple, and easy to apply. Ready to get started? CLICK HERE to set up your Label Solutions account. Whether you need tech support or you'd like to request a quote for a fire extinguisher label, get in touch with Label Solutions today. We're here to help you.